John Schuerholz, legendary president of the Atlanta Braves, will serve as grand marshal of the 5th annual Winship Win the Fight 5K run/walk to be held on Saturday, October 3. Schuerholz was successfully treated for prostate cancer last summer at Winship at Emory Saint Joseph’s Hospital. "It is an honor to preside over the 5th annual Winship Win the Fight 5K," says Schuerholz. "As a cancer survivor, it's important to me that the money raised at this event will stay right here in our community to benefit cancer research at Winship." 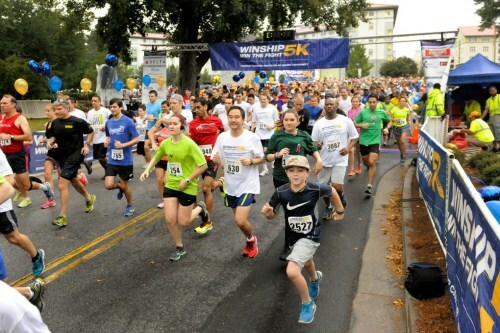 Registration is officially open for the Winship 5K, which starts and ends on the Emory campus, at the McDonough Field complex on Asbury Circle, and winds through the beautiful historic neighborhood of Druid Hills. Registration is $35 for non-chipped timed runners and walkers and $40 for a timing chip. The Winship 5K is a Peachtree Road Race qualifier and one of Atlanta’s most popular running events. Participants who cannot join the event on race day have an option to participate virtually as a "Sleep-in Warrior" and can donate to the cause and be recognized. "We are very excited that John Schuerholz will join thousands of others in supporting the Winship 5K this year," says Walter J. Curran, Jr., MD, Winship’s executive director. "In the five years since the event was started, we've raised over $1.6 million to fund critical cancer research projects at Winship." The Winship Win the Fight 5K is unique because it allows participants to direct their tax-deductible donations to benefit specific cancer research based on their personal interests. Funds can be directed to one of 18 different areas: Winship Director's Fund, Winship Bone Marrow Transplant Fund, Winship Brain Tumor Fund, Winship Glenn Family Breast Center Fund, Winship Colon & Rectal Cancer Fund, Winship Genitourinary (Bladder & Kidney) Oncology Fund, Winship Gynecological (Ovarian, Endometrial, & Cervical) Oncology Fund, Winship Head & Neck Cancer Fund, Winship Leukemia Fund, Winship Lung Cancer Fund, Winship Lymphoma Fund, Winship Melanoma & Skin Cancer Fund, Winship Multiple Myeloma Fund, Winship Ocular (Eye) Oncology Fund, Winship Pancreatic & Liver Oncology Fund, Winship Phase I Clinical Trials Fund, Winship Prostate Cancer Fund, and Winship Sarcoma Fund. For more information on the Winship Win the Fight 5K, log on to: winship5K.emory.edu or call (404) 727-6175. Also, like the Winship 5K on Facebook or follow on Twitter.